Take a peek at Vermont history. Discover an overview of Vermont's rich history, heritage, historic events, and culture. In 1609, French explorer Samuel de Champlain came upon a large lake in the area we know today as Vermont and named it after himself. The state's name comes from two French words vert (green) and mont (mountain), which explains Vermont's nickname, the "Green Mountain State." Ethan Allen and the Green Mountain Boys defended their homeland from the British during the Revolutionary War. 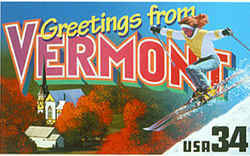 Vermont is one of the six New England states and became the 14th state in 1791. Some of Vermont's major industries are dairy farming and tourism. One of the most picturesque states, Vermont has millions of visitors each year who come to see the leaves turn colors in the fall and the snow-covered mountains in the winter. The state flower is the red clover and the tree is the sugar maple. Vermont maple syrup is one of the state's most popular products. The State of Vermont, tucked in the Northeast corner of the US, is the second smallest state in the Country with a population of less than 1 million people. Vermont was originally populated by various indigenous peoples of the Algonquin, Iroquois, and Abenaki nations. Many of Vermont town, county, river, and lake names are derivatives of old Indian names. The original Vermonters traveled and lived off the abundance of the land. Vermont's hills were filled with wildlife, and fish were bountiful in the many rivers, ponds and lakes. The Vermont region was explored and claimed for France by Samuel de Champlain in 1609 when the French explorer Samuel de Champlain sailed into what is now known as Lake Champlain. It was then, in the summer of 1609, when Vermont was first dubbed "Verde Mont," French for "Green Mountains." Like a good explorer would, Champlain claimed this land in the name of France, who eventually swapped Vermont to the British. The first English settlers moved into the area in 1724 and built Fort Dummer on the site of present-day Brattleboro. 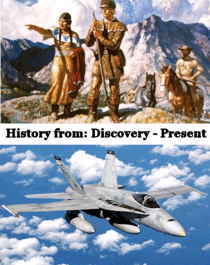 England gained control of the area in 1763 after the French and Indian Wars. In 1763, England was granted the land now known as Vermont via the Treaty of Paris. That Treaty ended the French and Indian war. Meanwhile, back in the new World, the land was claimed by both New Hampshire and New York. First organized to drive settlers from New York out of Vermont, the Green Mountain Boys, led by Ethan Allen, won fame by capturing Fort Ticonderoga from the British on May 10, 1775, in the early days of the Revolutionary War. In 1777, Vermont became the first state to outlaw slavery. By writing a constitution to outlaw slavery, Vermont allowed runaway slaves to stay in Vermont and allowed no one to own slaves in their state.The US didn't abolish slavery everywhere until aboout 100 years after Vermont outlawed slavery in the state. In fact, Vermont remained an independent republic until 1791, at which point it joined the United States as that fledgling nation's fourteenth member. Nonetheless, to this day Vermonters remain fiercely independent. Indeed, in 1996, Vermont's sole Congressional seat is held by the House of Representative's lone independent, Rep. Bernard Sanders. In 1815, Emma Willard founded higher education for women in Middlebury, Vermont.Until this point women had no or barely any opportunities to get an education beyond grammar school. Women weren't looked on as equals at that time because men were dominant. If Emma Willard hadn't founded the school, women wouldn't have opportunities to get well paying jobs to support themselves or families. 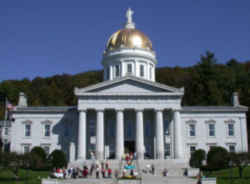 The Capitol of Vermont is Montpelier, with a population of under 10,000 people Montpelier is one of America's smallest Capitol Cities. Memories of recent Vermont history are embodied by the Vermont WPA Life Histories Project. Despite its rural nature, Vermont has a rich history in science and technology. High on a hilltop in southern Vermont, backed against a southern shield of tall spruce trees and facing north to Mount Ascutney is the home of the Springfield Telescope Makers, the oldest group of amateurs in the country devoted to building and using astronomical telescopes and other scientific instruments. Located on the east side of the road which leads from Brandon to the village of Forestdale, Vermont stands a two story house known as the Orange Smalley-Thomas Davenport Shop. It was probably built around 1830 or earlier as a workshop on the farm of Dr. Adoniram J. Smalley. Here in 1834, Orange Alfonso Smalley, experimented with electromagnetism. This shop is now known as the birthplace of the electric motor. The prosperity fostered by the railroad lasted well into the late 19th and early 20th centuries. The State's industries, businesses, agriculture, and population thrived. Two Vermont natives, Chester A. Arthur and Calvin Coolidge, served as President during this period. But changes in the 20th-century economy, that began early in the century, affected the viability of Vermont within an increasingly competitive and global market. Vermont has seen many changes during the last half of the 20th century. Tourists have discovered the State's natural beauty, ski slopes, and small town character. While tourism in Vermont has soared, other aspects of Vermont's economy, such as farming, milling and quarrying have experienced a decline. America's history is not static. It's fluid. It changes, grows, becomes richer, and more complex when any individual interacts with it.